The Brief of the Artling Gallery is a temporal pavilion to be situated at ‘The Lawn @ Marina Bay ‘ in front of the Singapore Promontary for a month, coinciding with the annual Formula 1 Race in Singapore. It is to serve as a Art Gallery with Display Gallery, Audition Hall as well as Bar and Cafe. 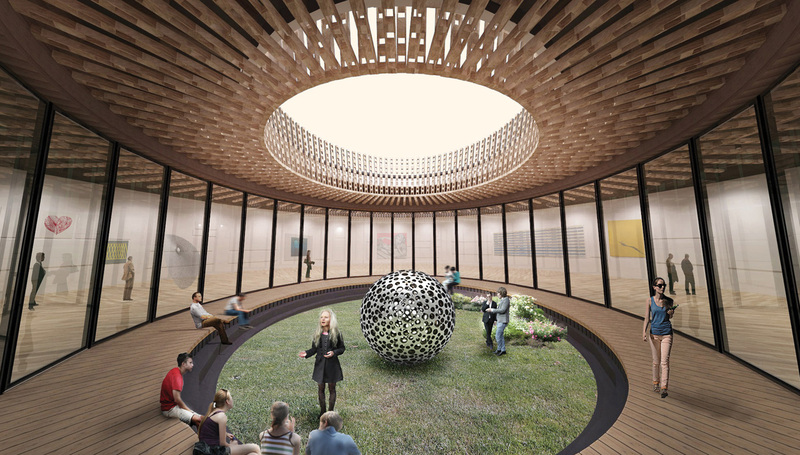 Our design for the pavilion, name ‘SPORE’ was intended to be built from recycled timber pallet that were used to transport large quantities of artworks to the site. 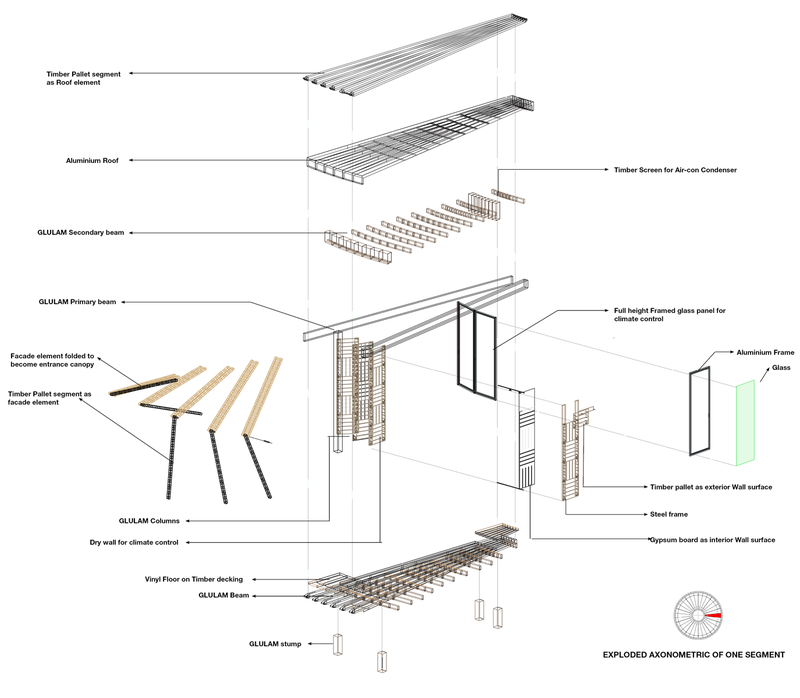 The pavilion is made up of modular components to ensure trans-portability and ease of assembly. 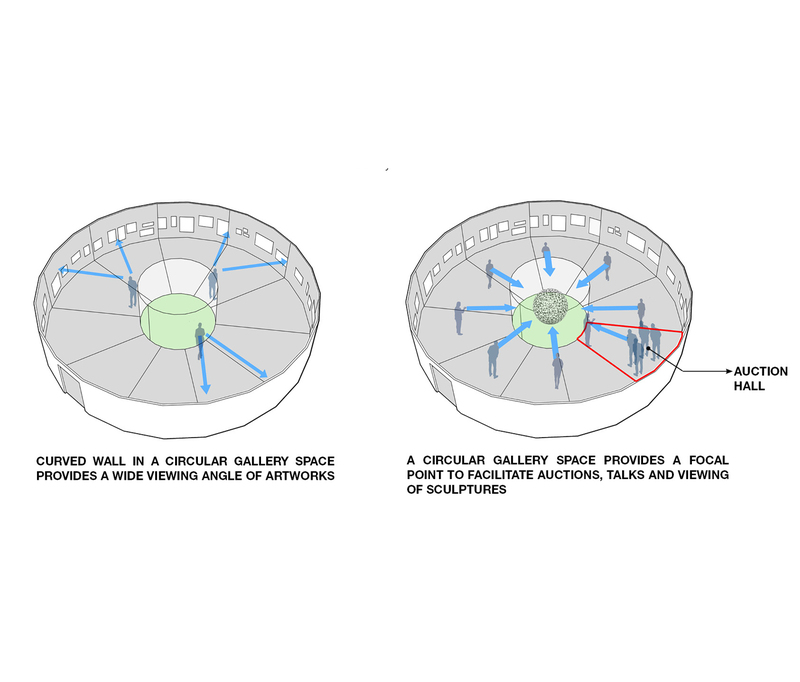 A circular space facilitates the viewing of paintings as its curved wall provides users with a wide viewing angle. Derived from cutting a circle into 10 equal parts, each modules are transportable and prefabricated offsite. And as a result, the pavilion can be a travelling showcase and can be reconfigured in multiple ways that best complement its surrounding. 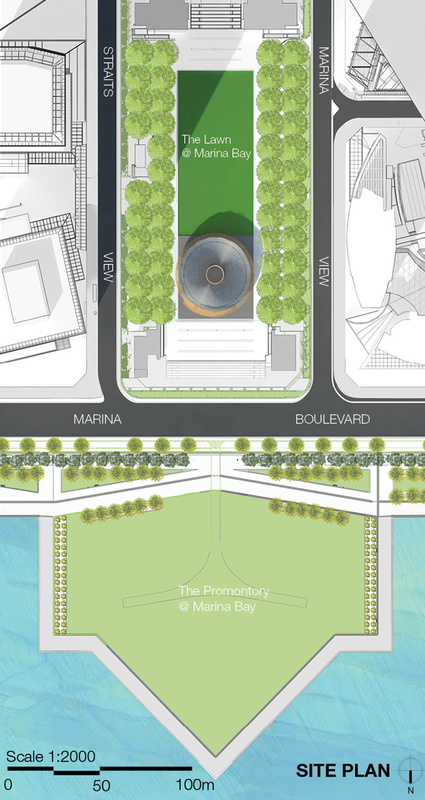 SPORE sits on the Lawn as a circle, a pure geometric shape, to contrast the surrounding sky-scrapers and act as a landmark. 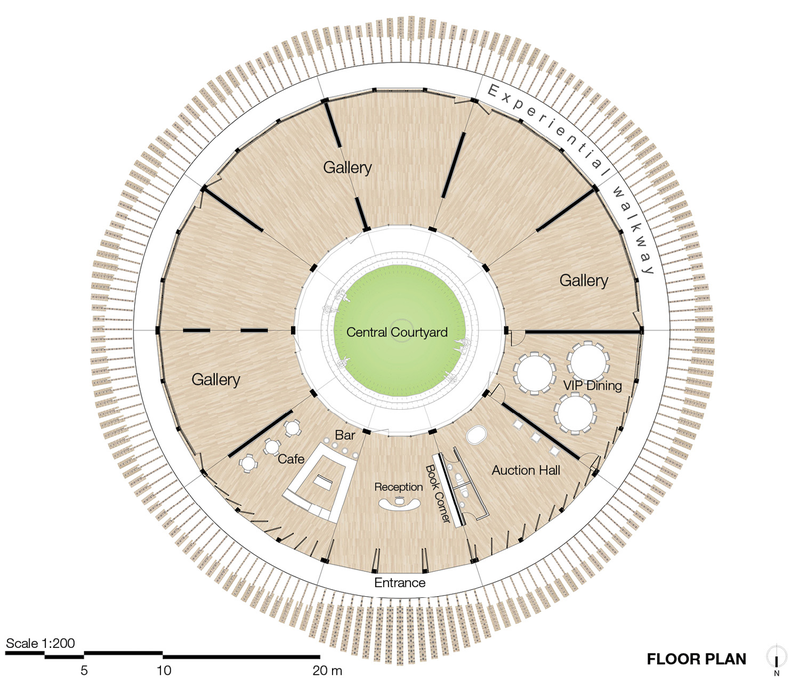 The circular plan is also ideal for the programme in the pavilion. A typical salon style gallery has a high density of paintings on the wall. A circular space facilitates the viewing of paintings as its curved wall provides user with a wide viewing angle. An auction hall requires a focal point as it involves the interaction between presenters and audience. A circular space provides a natural focal point by drawing attention to its center. 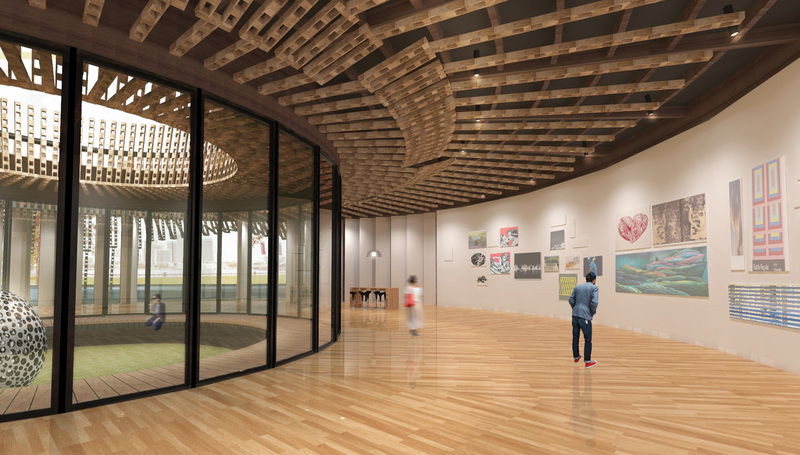 At the main gallery space is circular, users have a wide viewing angle of the artworks hung on a curved wall and is able to see more. Circular space provides a focal point which naturally draws attention from audience members to the auction presenter. The central courtyard serves to bring daylight into the gallery. Glass panels are used to separate the courtyard from the gallery space so as to create a controlled environment for housing sculptures and holding talks. The Timber Pallet is a robust material commonly used for industrial purposes such as transporting heavy goods over long distances. For the Artling exhibition, these timber pallets are needed to bring large quantities of artworks to the Lawn. Instead of disposing these pallets after use, there is an opportunity to use them as a building resource and transform them into the centerpiece of the pavilion. This not only reduces the total construction cost but also minimizes the carbon footprint of the pavilion. The peeling effect on the façade is created by the dynamic arrangement of the inner and outer envelope. The inner envelope is made up of pivoted partitions with Industrial timber pallet finish. These partitions are pivoted incrementally to correspond to the programme inside. For instance, the boards would be swung open at café entrances and sealed shut to form the walls of the gallery. 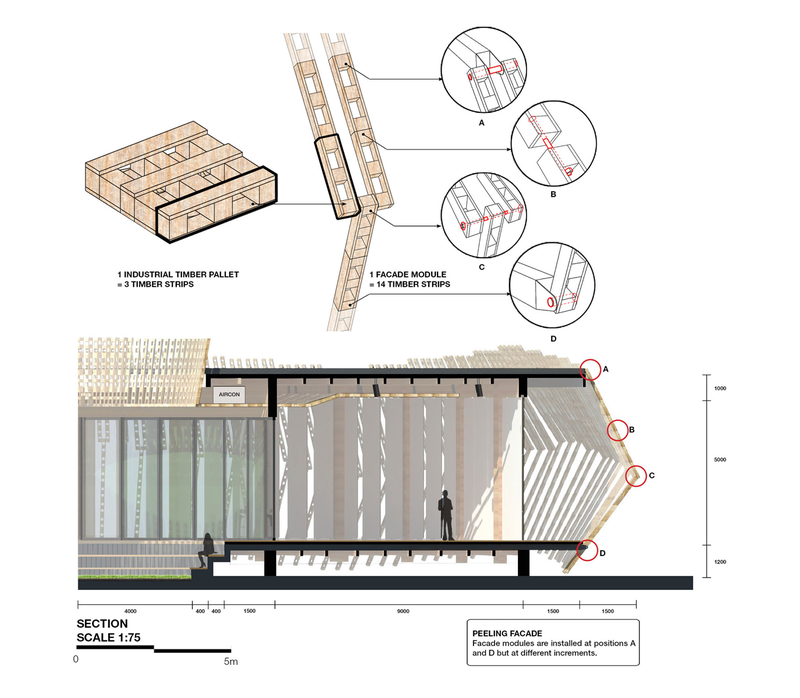 The outer envelope is composed of identical strips of Industrial timber pallets joined abutt and pivoted in the center. These identical strips are then fixed at varying positions to respond to the openness of the inner envelope. The result is a wave pattern that undulates at varying intensity. The wave pattern is designed to ‘peel’ upwards to reveal the main entrance.